HomeCuteCute Dachshund masters how to use tennis ball launcher at Dog Daycare! 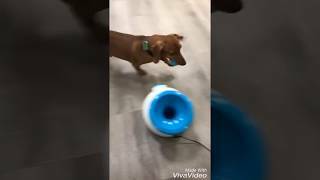 Energetic little Dachshund masters the doggie tennis ball launcher! At Paradise Pets we understand the concerns of leaving your beloved family member in someone elseʼs hands.Our mission is to provide the highest level of care for your pets to play and socialize in a fun and safe paradise like environment. As well as a full spa service to keep your pets looking and feeling their best! Donut the Mini Dachshund chasing tennis ball – SO CUTE!